“The New Evangelization” is one of those Catholic terms which has been tossed around just enough that many people are completely confident about their confused understanding of it. I frequently see it used to mean “evangelization through new media.” If that were really all the term meant, then I think we could be confident that the Church is responding, and will continue to respond fully to the call for a New Evangelization. But new media, while useful in its own ways, isn’t what the New Evangelization is really all about. Since it does not really matter what I say about these things, I will go with what my bishop, Donald Cardinal Wuerl, says. The New Evangelization is about each of us first of all cleaning up our own relationship with the Risen Christ and the Church. Then, from our renewed life, the New Evangelization is about passing on the joy of the Catholic faith to reawaken those who know the Gospel without actually knowing it. The contemporary culture has reached a point where it turns off what is not immediately accessible. Our society prefers to listen in sound bites, rather than in semesters. Slogans replace thoughtful explanations. The broad advances of globalization over a relatively short span of time have had significant effects on daily life. Entire generations have become disassociated from the support systems that facilitated the transmission of faith. But no darkness, no matter how dense, can thwart or shroud the seed of new life waiting to emerge in this fresh moment. The missionaries in the first evangelization covered immense geographic distances to spread the Good News. We, the missionaries of the New Evangelization, must surmount ideological distances just as immense, oftentimes before we ever journey beyond our own neighborhood or family. There are numerous people, particularly in the Western world, who have already heard of Jesus. Our call is to stir up again and rekindle in the midst of their daily life and concrete situation, a new awareness and familiarity with Jesus. We are called not just to announce, but to adapt our approach so as to attract and to urge an entire generation to find again the uncomplicated, genuine and tangible treasure of friendship with Jesus. This is our mandate: to witness to others so that they reawaken to and rediscover the vital and inexhaustible friendship of Jesus Christ. Sisters and brothers, our eagerness and zeal for the task can be both the invitation and support for those who take their first steps back to the community of faith, as the ever deepening life within the seed is drawn to the light. I hope all of us will see the New Evangelization as a lens through which we see everything that we are doing but now in the light of our understanding of how important it is for each of us to tell the story, share the excitement and be that leaven where the faith has gone flat and that salt where the faith has lost its zest. In every action, our starting point and goal is Jesus Christ. This pastoral initiative dedicated to the New Evangelization is the threshold of our own renewed, solid commitment, as a local Church, to the summons of Jesus. As we accept his promise of life in abundance, we also lean upon his promise so that we might find strength in every situation as we are called in new and, perhaps untried, directions. Culture is the field of the New Evangelization. Culture refers to the daily ethos, the various networks of understanding and meaning that give rise to the many everyday connections between the person, community and society. Culture forms the deeper and more vital link that relates the person to the community and the community to society. Every moment becomes a new opportunity to connect another person with the abundant Springtime that God promises. In this, we are protagonists of hope. Protagonists of hope. How often the Church calls for the impossible! I have very limited hope for the New Evangelization when I see the way that devout Catholic women interact online. Based on my (admittedly limited) experience, I believe that the New Evangelization is doomed. Apart from divine intervention, devout Catholics will choose to fight about appropriate etiquette rather than answer the Church’s call to share Christ with the faithful not in full communion with the Church’s ideals. This unwillingness to participate in the New Evangelization has been made incredibly clear in recent backlash to a linkup where Catholic women post about what they wore to church on Sunday. Normal people outside of the limited target audience would probably yawn. But devout Catholic women are hardly normal. Instead of ignoring something which does not seem useful to them personally, they will invest the emotional energy required to tear it apart. If you are not from these circles you might think that this is just typical female cattiness. But I am immersed enough to believe that these women are sincere rather than jealous. Unfortunately, giving them the benefit of the doubt turns out to make their reaction seem appalling rather than annoying. Read this with the belief that it was written in good faith and sincerity by a woman who considers herself to be fully living out the call of the Church, by a woman who sees herself as properly understanding the beauty of the call of Christ while other women are failing. Because if you read this as written (and subsequently quoted) with sincere spiritual reservations about this linkup, then you cannot help but be horrified by the fact that the response of these devout women is one of absolute defiance of all that is called for by the New Evangelization. Let’s say that these devout women are correct in their understanding. Let’s say that this linkup does detract from all that we hope to receive in participating in Sunday Mass. What then? Well, if one cared to see with the lens of the New Evangelization, she would seek to repropose Christ to her sisters who have failed to appreciate the great beauty of the life to which they are called and instead embraced vanity. She would take 10 seconds to read about the women behind the linkup. That would allow her to see that both women are very young and that one of them is not yet even Catholic. It is clearly inappropriate to expect these two women to be the spiritual peer of our hypothetical devout woman who has spent years being formed in the faith. Thus a devout woman who cared about the call of the New Evangelization would seek to reach these women in a way that enabled her to bring them back to a more faithful life. Perhaps she would follow the example of Our Lord who ate with prostitutes and lower herself to actually participate in the linkup. Perhaps she could not bring herself to risk the scandal of participating in something she believes to be wrong, but she could still comment on the blogs of her lost sisters and build relationships with them. But this is a dream, not reality. In reality, devout Catholic women like to criticize without going to the bother of building relationships which allow for both conversation and conversion. They would rather live in a limited bubble of perfection than to squander their precious time reaching out to others who do not meet their standards. There are, of course, a few exceptions. 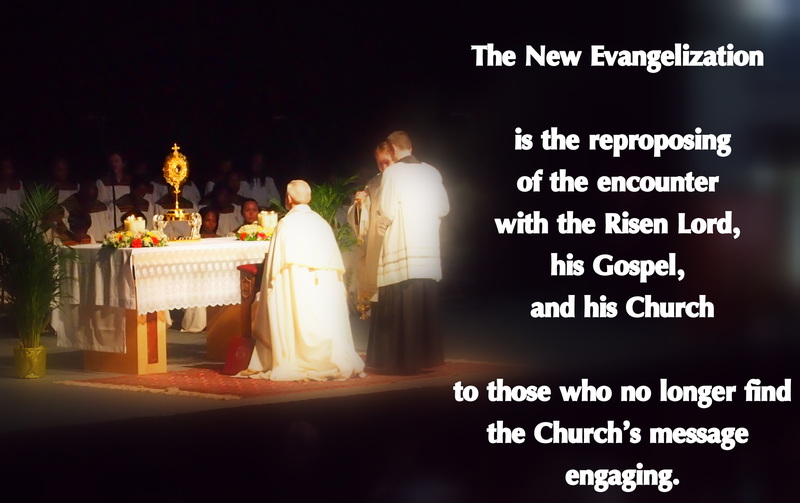 But a few exceptions are not enough to carry out the incredible burden of the New Evangelization. The New Evangelization is doomed. Devout Catholics must undergo a radical conversion which enables them to find drawing others back to Christ more appealing than stepping back and criticizing those who do not live up to their standards. Unless this happens, the bishops are wasting their time talking about a New Evangelization. My bishop has put an incredible amount of work into promoting the New Evangelization. He calls me to be a protagonist of hope. But the New Evangelization is exhausting. It requires a willingness to change, to adapt, to reach out to others when we would much rather analyze their mistakes. The New Evangelization requires one to care first and critique later. I do not have the emotional energy to sustain friendships with women whom I deeply admire, with women whom I rely on as mentors. How then am I supposed to have energy to respond to all of the faithful women whom I see as missing out on the Church’s greatest joys? Instead I offer you this post in beautiful irony. I make no claim to be a devout Catholic woman, but I fail right along with them. I remain unfaithfully yours. My fervent prayer is that you will succeed where I fail, that you will joyfully embrace the call of the New Evangelization to get over yourself and draw others to Christ. The fate of the New Evangelization is in your hands. I haven’t read that pastoral letter, and I love those quotes. Thanks for sharing them, and for challenging us to think critically about our knee-jerk reactions, as always. Very nice. You are one in a million. You’re right, it will take an incredible miracle for the radical conversion necessary to make the new evangelization happen (exactly because of posts like this). It’s highly unlikely…but I still have hope. I originally intended a much longer and more detailed response to this. . . which would have just been another example of being part of the problem. Typing is easy. Too easy. Thank you for sharing this article. Just wondering where the photo above was taken a little about the photo. Who is the priest and where was beautiful service taking place at? Our priest has made several comments about dressing appropriately for mass. The lectors and eucharistic ministers even got a memo. “Do I dress appropriately for mass” was even part of the examination of conscience in the communal penance service. Looked at the linkup and it seemed to me like it is was a gentle encouragement to try to dress appropropriately in recognition of the importance of the occasion. Honestly, it does take a bit of thought and effort. Why label it vanity?